Need a boost to get physically fit? Unfortunately, nearly 70 percent of Americans do not exercise regularly. Ruth Wassinger used to be among them…until she turned fifty. That’s when she started running. She began with short runs around the block and has gone on to run in countless races, including the prestigious Boston Marathon. Not only did she become physically fit, she also made an important discovery: as she became fit, all other areas of her life improved. She became a better wife, mother, public servant, leader, and financial advisor. Now, many marathons later, Ruth encourages others to get up and running and reap the benefits that go with the simple act of putting one foot in front of the other, whatever the speed. 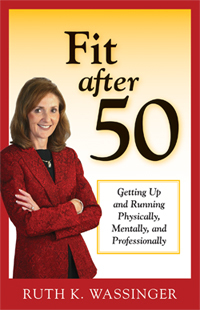 In Fit after 50, she leads readers through the process of transforming their own lives—physically, mentally, and professionally—and she shares her personal journey, which includes one “marathon” that had her running for her life.